Goodnow Community Center’s vision is to provide meaningful educational and artistic enrichment to youth while giving support and identity to the Frankford community. Goodnow Community Center will provide a safe, healthy, respectful and fun environment specializing in academic tutoring, intellectual and artistic enrichment for youth 2nd grade through high school. We also make available to the community special events and creative workshops. Through the International Rescue Committee, physical health and English classes are given to the refugees in our community. In addition, Karesa Bari: <?<span>Community Garden is tended by refugee families. 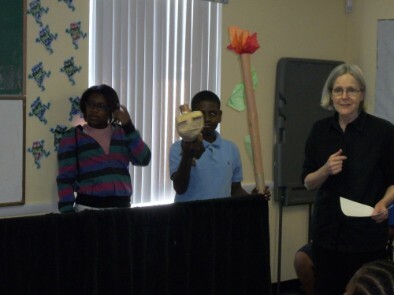 Carolyn Krober of Young Audiences facilitated a workshop with Goodnow youth making puppets and ending with a puppet show. 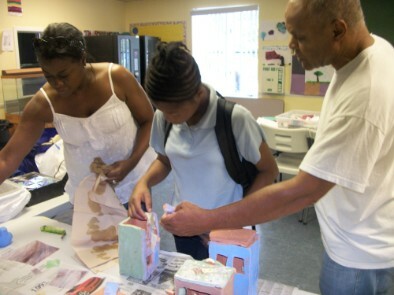 Herb Massey of Young Audiences facilitated a ceramic workshop with the Goodnow youth making row houses with battery operated tea lights.